After weeks of backyard blackberry picking last summer, I ended up with 2 gallon-sized bags of berries in the freezer to tide me over until next August. I made muffins and jam, which I then used in cakes and cheesecakes. To make berry jam, you can either add pectin to help it thicken, a plant derived gelling agent, cook it with pectin rich fruits like apples, or cook the berries for a very, very long time until it's thick enough to set on its own. The third way is how I make my jams, pectinless freezer jams. I am too paranoid about botulism to can foods, so I opt to store them in the freezer. And I don't have or know (and a little lazy to learn) how to use pectin. The benefit of pectinless jams is that it is cooked down so much that it is pure berry concentrate, one tiny spoonful is the flavor equivalent of a mouthful of berries so a little will go a very long way. But because it cooks down so much, the downside, though, is that a big pot of berries will yield only 1 or 2 cups of jam, and with seedy berries like raspberries or blackberries, the seed density becomes highly concentrated as well. Sure, seeds are rustic, but when they're so condensed like that, it's not too enjoyable. Some recipes give you the impression that you can simply push the berries through a strainer as if with a few smooshes with a spatula, you'll end up with perfect seedless puree in a bowl and the unwanted seeds left behind in the strainer. If you've ever tried this, you'll know that it's not the case. I couldn't help but laugh when Jen wrote about the same thing. See? We food bloggers tell it how it is. What really happens is after about 10 minutes of pushing, smearing, and smooshing you end up with about a quarter cup of blackberry juice in the bowl in which you hoped would collect a bounty of seedless berry puree - half cup if you're lucky. And instead you get juice on yourself, the counters, and maybe even a few splotches here and there on the walls, and a strainer still full of mashed up blackberries. This is exactly why I dropped fifty bucks on a shiny new food mill . Gone are the days of stained wooden spoons and bent sieves. It still takes some elbow grease to crank the food mill but it's a helluvalot better than using a strainer. Plus, it's another sparkly toy to add to the kitchen. I finally used up the last of my blackberry stash and made one last batch of seedless blackberry jam. The jam is sweet, without being cloying, with just the right amount of tart to make your lips pucker a bit and tastes like summer and sunshine. With the last of my 2007 blackberry jam, I made a Linzer Torte, a beautiful lattice topped tart named for the city of Linz, Austria. The buttery, crumbly crust is made from ground nuts (I used a combination of almonds and hazelnuts) and flavored with lemon zest and a hint of spices. It is traditionally filled with a currant or raspberry jam so blackberry jam isn't too much of a departure. Or you can make linzer cookies. Preheat the oven to 350 degrees F. Spread the hazelnuts in an even layer on a baking sheet and bake until they're brown and fragrant, about 8 to 10 minutes. Pour the hazelnuts onto a clean kitchen towel and cover them up in the towel and let them steam for a minute or two. Rub the hazelnuts together in the towel to get their skins off. Remove the hazelnuts and shake the towel out outside or carefully in the trash so the skins don't fly everywhere. Cool the nuts completely before using. Pulse the hazelnuts, almonds, and sugar sugar in a food processor until they are finely ground. The sugar will keep the nuts from sticking together from the oils. If they are starting to stick together add a few tablespoons of the flour and continue to pulse. Add the ground nuts to a large bowl with the flour, cinnamon, cloves, and salt, and whisk to combine. Cream the butter in the bowl of a stand mixer or with a hand mixer. Add the egg, lemon zest, and vanilla extract and continue to beat until fluffy. Slowly mix in the dry ingredients and continue to mix until the dough has formed. Turn the dough onto a lightly floured work surface. Gather the dough then divide it into two equal pieces. Wrap each piece in a piece of plastic wrap, flatten in a round disc, and chill in the fridge for at least 2 hours or in the freezer for 20 - 30 minutes, or until the dough is chilled and firm but not too hard. Preheat the oven to 375 degrees F and adjust the oven rack to the lower middle position. After the dough has chilled, remove one piece and roll it out into a circle large enough to fit into a 9inch tart pan. Press the crust into the tart pan. Trim the outer edge of the dough by cutting off the top 1/2 inch of the sides of the dough, otherwise the sides of the tart will be too tall. Spread the jam evenly in the crust. 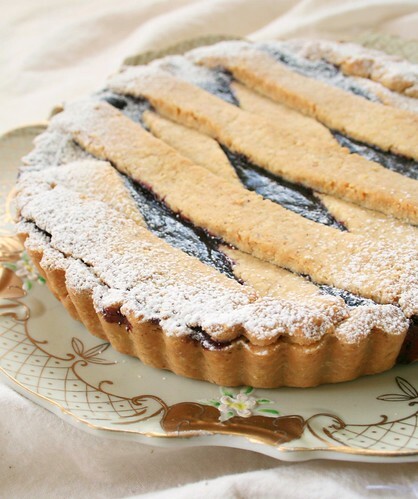 The lattice top for this linzer torte is laid at an angle, not woven. Roll out the second piece of dough into a circle that's slightly larger than the diameter of the tart pan. Trim the edges of the piece of dough until it is a 9 inch circle. Cut the dough into 3/4 inch strips. Lay one set of dough strips across the tart in parallel lines. Then lay the second layer of strips at an angle on top of the first layer. Bake at 375 deg F for about 25 to 30 minutes, until the crust is golden brown. Let the tart cool to room temperature and can be kept at room temperature for up to 3 days. Some sources say the tart is best on the day it's made while others say it is best after sitting for a day. Dust with powdered sugar or top with whipped cream before serving. Would you believe I've never made a linzer torte? Yours is absolutely lovely. Your torte is just beautiful! I'll bet that blackberry jam is out of this world too. I love it! The torte looks just wonderful. I wish I had a stack of frozen blackberrys in my freezer to make this during cold days of winter when I want a taste of summer! Great pic! Pectin is really easy to work with - consider giving it a try sometime with an easy recipe. I think you'll be pleasantly surprised! I feared it too, but now I just love making jams and jellies with it. i want to go berry picking in my backyard! Thanks! I just can't describe how much I love this jam. Thank you! The blackberries did help chase away the wintery blues. That's good to know, I'll have to try working with pectin someday. The neighbors aren't too happy about the blackberry runners invading their yard, hehe. this is a gorgeous torte! i love to make jam as well. you can use lemon juice instead of pectin and cook it a bit longer. that is usually what i do, plus i find it brightens the flavor. good luck in your jam endeavors! Nicely done - it's beautiful. This is how fresh fruit should be used. That torte looks amazing. This is my type of dessert. I appreciate the useful tips on how to prepare a proper jam.